No one likes typing on a touchscreen keyboard. Even after using an iPhone for five years, I avoid writing anything more than a short text message or email on it whenever possible. We know Apple’s been working hard to bring tactile feedback to touchscreen devices from previous patents, but this particular invention is one of its weirder ideas. It’s a clip-on accessory that fits onto a an iPod, iPhone, or iPad and provides tactile buttons for typing. 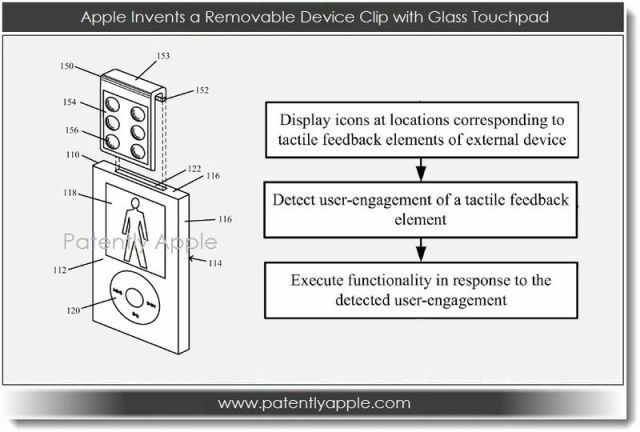 Apple’s patent, discovered by Patently Apple, describes a removable clip for electronic devices that could add tactile feedback to a touchscreen using rubber “domes” that act as buttons. The apparatus would sit above a touchscreen display, and could be transparent, allowing the user to see the on-screen keyboard beneath it. Alternatively, it could have its own LCD display built-in, which would allow it to display different functions depending on how it’s used. For example, the device could display a traditional keyboard while you’re working inside the Pages app, but could then change into some form of control pad when you open up a game. In addition to this, the device would operate as a traditional clip, allowing smaller device like the iPod nano to be attached to your clothing. Apple’s patent was first filed during the third quarter of 2011, and its diagrams feature what looks like a third- or fourth-generation iPod nano. It’s not a recent invention, then, so it could be one that Apple has decided not to pursue. Although I’m sure it would be useful in some cases, it doesn’t sound like a bit of strange idea. I recently wrote about a similar invention for the iPhone called Spoke, which adds a tactile keyboard to the handsets display — and that looked ghastly.